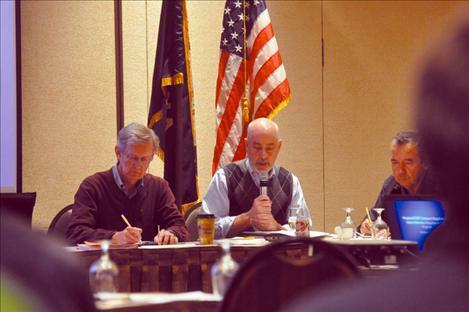 Duane Mecham, senior attorney for the Department of the Interior’s Portland office, speaks at a negotiating session for the proposed Confederated Salish and Kootenai Water Compact. MISSOULA – Tribal officials said they will have to mull over changes proposed Oct. 27 by the State of Montana to a draft version of the Confederated Salish and Kootenai Water Compact. The tribal negotiating team’s initial reaction to the document was that state and tribal officials weren’t on the same page for parts of the compact, which will settle the Tribes water rights claims and has one last chance to be passed by the state’s legislature. If an agreement is not reached by June 30, 2015, tribal officials have said they will file as many as 10,000 water rights claims in their aboriginal home territory that stretches are far east as Billings. The state, federal, and tribal governments have worked since early fall to renegotiate key elements of a former Water Use Agreement that was an addendum to the 2013 version of the compact that failed to pass the Montana Legislature. The renegotiation has been narrowly focused on the delivery of water to the Flathead Indian Irrigation Project. Much time has been spent creating a mechanism called “adaptive management” that puts plans in place for shared water shortage between the Tribes and irrigators. It is also intended to have some element of verification to make sure River Diversion Allowances that feed into the irrigation project are equal to historic use. The state provided a 2-page outlined summary of its draft proposal that included suggestions about making sure water amounts equivalent to historic use are delivered to irrigators through the River Diversion Allowances. The state also spelled out the hierarchy of which water rights have priority as: Tribes Minimum Enforceable Flows, project Minimum Pool Levels, project River Diversion Allowances, and Tribes’ Target In-Stream Flows. A tiered system of where to pull water from in dry years was also presented with water first being taken from Flathead Indian Irrigation Project Reservoirs. If more water is needed, the state recommends that excess pumping and water from Hungry Horse Reservoir be used to meet demand. 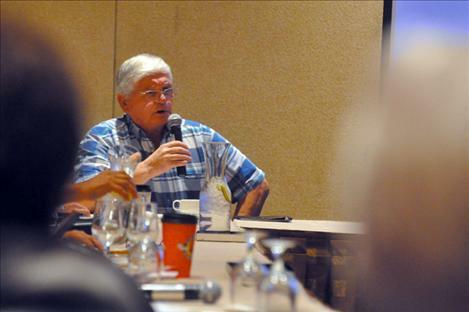 The tribal negotiating team found numerous unspecified problems with the proposal. Montana Reserved Water Rights Chairman Chris Tweeten said his team put the outline together in an effort to deal with elements of a tribal proposal presented Oct. 15 that the state’s team members didn’t understand or agree with. “We would hope that the Tribes could respond to what’s in the outline and give us your thoughts about it and if there are things that need to be clarified to make things more understandable then we will certainly be happy to accept any questions,” Tweeten said. The tribal team asked few questions and said they would get back to the state. 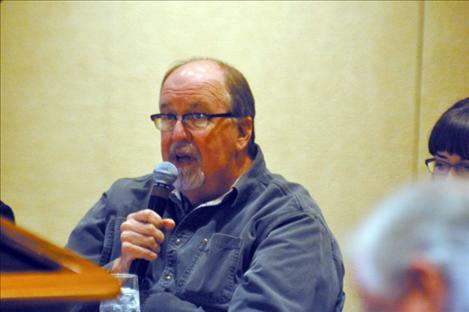 A negotiating session is set for Nov. 5 in Polson.